Problem: Certain dates appear as ######## and certain numbers convert to scientific notation. Solution: In the FileAccess node, wrap the SQL query variable with quotation marks and put a “=” before it. Problem: Strings with commas get split at the comma in a csv file. Example in file: The value “Anchin, Block, & Anchin” is getting split into 3 columns as the flow is interpreting the commas as separators. Solution: In the FileAccess node, wrap the SQL query variable with quotation marks to include the commas as part of the string. 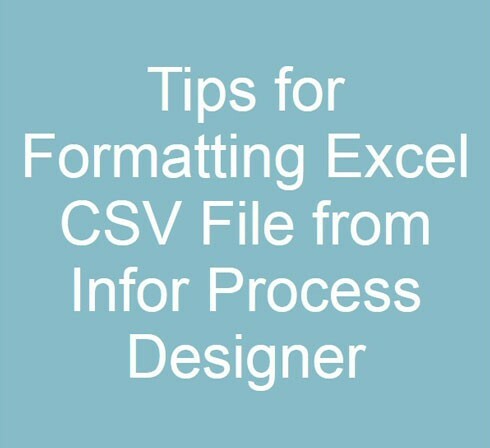 Problem: Certain number values lose their zeroes at the front when written to csv format. 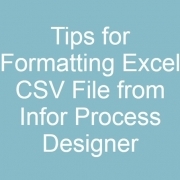 Example in file: The values in column C should be 001, 002, etc. instead of 1,2.